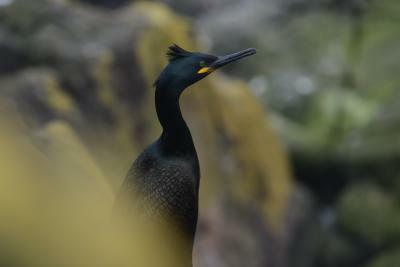 The researchers studied a population of European shags on the Isle of May National Nature Reserve, Scotland and measured how parasites affect energy levels and behaviour of individual birds, something which hasn't been done before in a wild population. They used an endoscope to count individual worms in the birds' stomachs and miniaturised electronic tags recorded the movement and energy of the birds. They then calculated the total energy used on each day, and the energy used for flying, diving and resting. Researchers found that the total energy used per day did not depend on the amount of parasites, but females with higher levels of parasites had more costly flight and spent less time flying each day, presumably to avoid using too much energy. "We found that the more parasites a female bird had, the more this affected their ability to fly when feeding." "This is important as seabirds catch fish at sea in order to feed themselves and their chicks. These trips are costly but essential to raise young. If the costs and duration of the flight while feeding are affected, this may reduce their ability to raise young which could have implications for the population." CEH population ecologist Sarah Burthe, who was involved in the study and is co-author of the paper, said: "It is extremely unusual and challenging to be able to measure both parasites and energetic expenditure in wild animals, so this is a very exciting development. "We already know from previous work that parasites can negatively affect the ability of parents to successfully raise chicks. "The really interesting thing about this current work is that it shows the mechanism by which parasites affect the host." The study was carried out over four years, from 2014-2017, on the Isle of May in Scotland as part of a long-term study conducted by CEH. The paper `The energetic cost of parasitism in a wild population' is published in the journal Proceedings of the Royal Society B. The research also involved Biomathematics and Statistics Scotland and Tokyo University.